Please connect Board’s letter no. 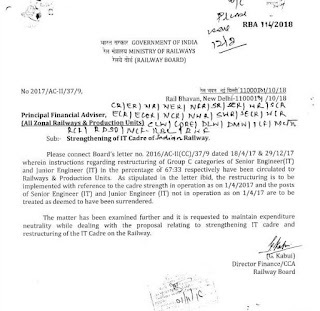 2016/AC-II(CC)/37/9 dated 18/4/17 & 29/12/17 wherein instructions regarding restructuring of Group C categories of Senior Engineer(IT) and Junior Engineer (IT) in the percentage of 67:33 respectively have been circulated to Railways & Production Units. 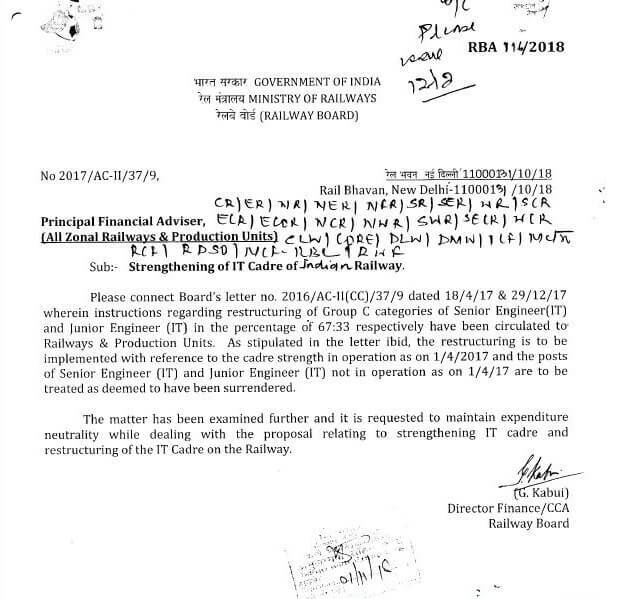 As stipulated in the letter ibid the restructuring is to be implemented with reference to the cadre strength in operation as on 1/4/2017 and the posts of Senior Engineer (IT) and Junior Engineer (IT) not in Operation as on 1/4/17 are to be treated as deemed to have been surrendered.